The five Riverhouse Cabins sit 10-20 feet back from the Swan riverbank, with four separate decks that are perched above the slow moving Swan River. The stretch of river that flows past the cabins provides great swimming and fishing opportunities. Each Cabin rental includes the use of canoes, rowboat, mountain bikes, and barbecue grills. Each cabin is equipped with a kitchenette containing a microwave, hot plate, toaster, coffeemaker, refrigerator, wine goblets, silver, dishes, and a mini bar. Mini bars are stocked with snacks, candies, liqueurs, and wines. Each cabin is uniquely decorated with Montana and New England antiques-the warmth and vision of a Montana mountain experience presented in a rustic, elegant way. The grounds feature a private deck area overlooking the Swan River, with fishing, sunbathing, and boating accessibility. Pristine gardens, wild game, and waterfowl all join together for a relaxing atmosphere to enjoy. Take in the afternoons peaceful scenery relaxing on the riverside deck as the Swan river slowly flows by. Breathe the fresh smell of pine trees and listen to the wind as it gently sways them back and forth. Decks are perfect for viewing all the abundant wild life, sunbathing, or just quiet time with the family. The evening sunset view from our decks gives you a chance to wind down and discuss your days activities over a glass of wine or favorite beverage or snack. The bedrooms are furnished with either queen or king sized beds, with Posturpedic mattresses. Each cabin has its own private bath with a Jacuzzi tub/shower, except for #5 does not have a Jacuzzi tub. Fresh towels and maid service are provided daily. All cabins are neat and clean inside and rustic on the outside. 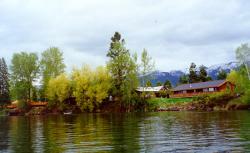 Restaurant is 3 star rated, Travel & Leisure Best in Montana. Directions: The Coyote Roadhouse/Riverhouse and Restaurant is located off Highway 209 between Bigfork and Ferndale, snuggled between the Mission Mountains and the Swan Mountain Ranges. We are surrounded by trees and right on the Swan River. We are 4.5 miles from Flathead Lake and Bigfork.